ASE Labs: I'm getting a new pc! I'm getting a new pc! And I need your help! I plan on getting this, http://www.amazon.com/gp/product/B003FK63D0/ref=ord_cart_shr?ie=UTF8&m=ATVPDKIKX0DER. I know its refurbished but I think its a decent deal. (If you think you can find me a better deal, link me). Any way, That's what I plan on getting and I plan on playing SC2 and some EVE online. And I'm going to get a decent GPU for it. So that's where you guys come in, What do you recommend for a decent GPU? First I would not purchase a pre-built system, however, if you are not comfortable building your own, this may be the way to go. At least it is not an HP, Compaq, or Dell! As for the GPU, that is dependent on your current concerns. First, what is your budget? That would have a lot to do with it. I guess it boils down to one question; are you one to have the newest products on the list? If so, then look at the AMD 6xxx series, and the Nvidia 5xx series of cards, and if not, wait about one to two months and you will be able to pick up the last series for about half the price they have been for the last 6 months. The main problem I see with the computer looks to be airflow. You can buy that and put a big GPU in it, but it would almost certainly overheat based on how that case looks to be designed. As stinger608 mentioned, you could do far worse, but you could also do far better, even if you intended on sticking to pre-built. The two games you mentioned aren't a drain on GPUs at all. SC2 will run fine with much older hardware at high settings. EVE should as well. I'm always weary of getting prebuilt systems, myself. The reason I'm going with pre built is because I'm not really trying to break the bank if that makes any sense. The way I figure it is that if I save money on a pre built I can get a decent GPU. And my budget is around $250 - $300. I planned on getting a extra fan or two to go in there. http://ecx.images-amazon.com/images/I/61kE1s5fiZL.jpg There are a few open spaces. Actually Tornado, the Asus Essentio case really has pretty good air flow to be honest. I believe it has a front 120mm, rear 120mm, and a top 120mm blowhole. I do not think, however, that it has the case side fan availability to the case. Hmm, I just noticed something. Will I have to upgrade my power supply if I where to get a new graphics card? I'm pretty sure that the one in the pc is only 400 watts. Not really. Most computers certainly don't need that much capacity. Where it matters is in sustained load, though. You should be fine. I agree with Aron. I am to assume that it has an Antec 400 watt PSU? The only thing I would be concerned with, is if you run multiple video cards in SLi or CrossfireX. That or running a very high end card such as an Nvidia 480, or ATI HD5870. If that was the case, then yes, I would upgrade your power supply to at least a good quality 650 watt or better. By quality I am referring to Corsair, OCZ, Antec, PC Power & Cooling, Seasonic, or SilverStone. One may even look at Fortrain, or XFX for example. These listed are all quality units, but of course they all come with a price. Corsair has been one of the better "bang for the buck" power supplies if you plan on getting an upgrade. None the less, which power supply is included in that system? I'm not sure of what power supply comes in the system but now I'm kind of second guessing it. Second guessing my decision on the pc that is. I think I might get a bare bones kit or something. Or maybe even build my own, I'll have to save up for a little while longer but I'm not worried about waiting. I would rather say I built my pc. Any recommendations? Ok, I've started building my pc. I'm going to order the parts through out the month. 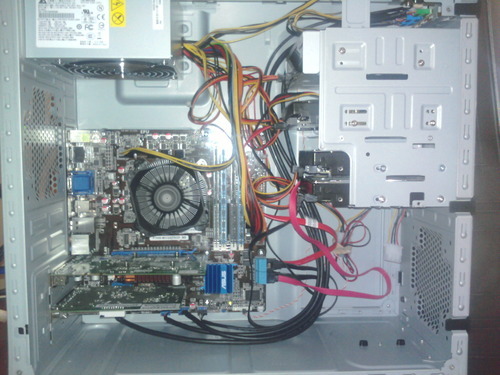 Right now I'm just taking care of the cheap stuff such as case, disk drive and power supply. I even ordered an extra case fan because I ordered an Antec 300 and there is no fan supplied for the side.